This unique device has been helping stop false fire alarms around the world for decades, without restricting legitimate operation of your pull station. Custom versions of this same cover are used to protect devices such as access controls, digital keypads, smaller manual pull stations, shutdown switches in computer rooms or workshops and many more. These versatile covers offer excellent protection against physical damage (both accidental and intentional). 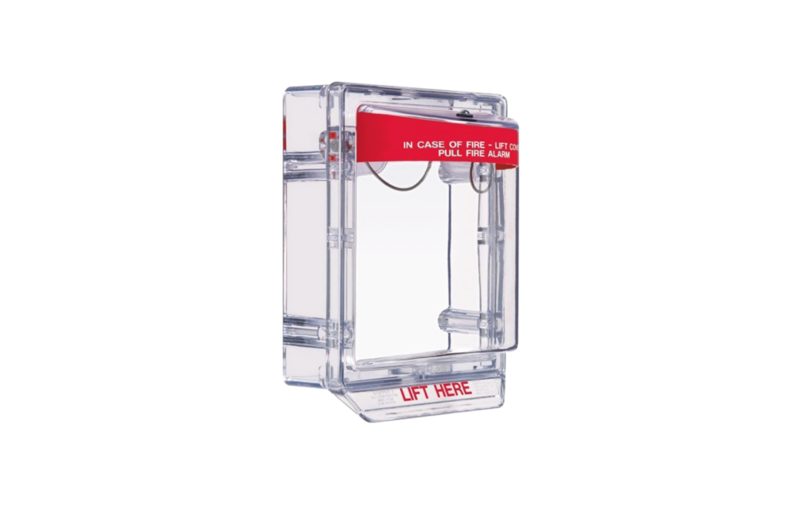 The Mini Stopper (STI-6500) consists of a clear, tough polycarbonate cover and frame that fits over the unit you wish to protect. When additional security is needed, the Mini Stopper® II (STI-6600) unit with the 9 VDC horn is recommended. When the cover is lifted to gain access to the protected unit, its battery powered alarm emits a piercing 105 dB at a one foot distance. Immediate attention is drawn to the area and a prankster will either run or be caught. With gaskets, Mini Weather Stopper® (STI-6525) can dramatically extend the life of equipment mounted in saltwater areas, areas requiring frequent hosing down and in severe environments inside and out. Protects against vandalism, accidental damage and grime as well as severe environments inside and outside. Perfect for protecting shutdown switches in computer rooms and workshops as well as other push buttons. STI-6500 and STI-6505 can be used over volume and lighting controls.